Battery Gunnison is a US Army coast-defense Artillery emplacement at Fort Hancock that is being meticulously restored to its configuration in 1943, at the height of World War 2 (1939-45). 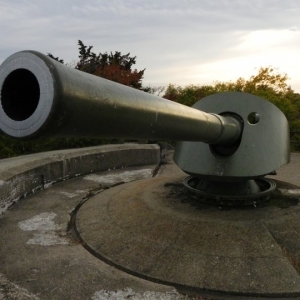 Built in 1904, the structure retains its rare M1900 six-inch caliber guns. Its interior spaces have been refurbished, and it has the only restored Coast Artillery "Plotting Room," where math equations were tabulated - by hand! The Battery is a snapshot in time, and an amazing educational opportunity to learn about math, science and history in a "hands-on" environment, and a tribute to the Greatest Generation.